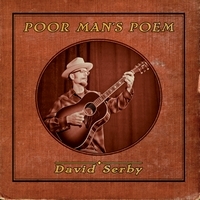 “Those who can not remember the past are condemned to repeat it.” George Santayana wrote those words over a hundred years ago but it is a philosophy that David Serby takes to heart on his new album, Poor Man’s Poem, a song cycle set in 19th century America. A friend’s dire financial troubles and subsequent suicide attempt led Serby to write “Virginia Rail,” about a man struggling (ultimately unsuccessfully) to provide for his family. This song - the first one that he wrote for this album – showed him a way to write about what was concerning him by filtering it through American history. For example, Serby penned the Western tale “I Just Stole Back What I Was Mine” (about a man’s ill-fated attempt get revenge on Wells Fargo) after reading The Big Short, Michael Lewis’ book about today’s financial crisis. Serby’s song inspirations ranged from Jesse James to the financial panic of 1856. The former informed “Lay Down My Colt,” where Serby uses the story about a young Jesse James witnessing the torture-style non-fatal hanging of his step-father by Union troops as a metaphor for the strangling of the American family that he sees happening today by Wall Street and big corporations. “Off The Caroliners” deals with a shipload of California gold sinking off the Carolina coast, which triggered a financial panic and popped a real estate balloon as well as ruining California miners’ chance to make some money. While this project found him attempting something new, Serby teamed up again with producer/multi-instrumentalist Ed Tree, who also produced his prior albums. “We are really a pretty good team. It’s a joy and honor work with Ed,” who has collaborated with musicians like Al Stewart, Spencer Davis and Rita Coolidge. Serby’s plan for this disc, which he was able to stick to fairly well, was to write a song every week or so and demo them with Tree and the various folks brought in to play on the tracks. Serby had imagined this project as a stripped-down acoustic effort, something like a cross between Bruce Springsteen’s Nebraska and Dave Alvin’s Black Jack David. Although his collaboration with Tree expanded the arrangements slightly, Serby still believes that they kept things under control - “I don’t think it sounds canned or over produced,” he asserts. They didn’t attempt to gimmick up the sound by making it sound like an ancient field recording. Also, by making the songs first-person narratives, they wind up being more emotionally resonant than just being historical ballads. Dave Alvin provides a good touchstone for both Serby’s current album and his past work. His earlier records - I Just Don’t Go Home (2006), Another Sleepless Night (2007) and Honky Tonk And Vine (2009) – mined gritty California honky tonk vibe that Alvin has. These albums all attracted critical praise, with Vine, in particularly, drawing praise. The esteemed critic Chris Morris hailed the album as one of the year’s best, while Ink 19 called it as “some of the best country music you’ll hear this year.” Serby, who opened the inaugural Stagecoach Music Festival, was invited back this year to play at the important country music festival. Serby has been playing this song cycle as a set live. He sees Poor Man’s Poem as being like a book and thinks it would feel strange to include songs from other albums with these new ones. While he has played these songs live with his band, he is also excited at the prospect of performing them solo or just with Tree accompanying him. Besides giving him more touring opportunities, Serby also finds these emotionally compelling songs perfect for him to play just with his guitar.